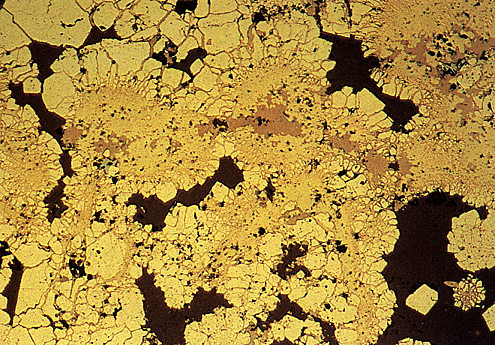 Radiating aggregates of pyrite (light yellow-white, top left) have been extensively replaced by copper-iron sulphides, but locally are unreplaced (top left). The cores to most of the aggregates are now chalcopyrite (yellow, centre) and bornite (brown, centre top) with rare haematite (blue, centre left, top right) laths. Minor amounts of relict pyrite are visible within the copper-iron sulphides (centre right). Quartz (black) is the gangue.